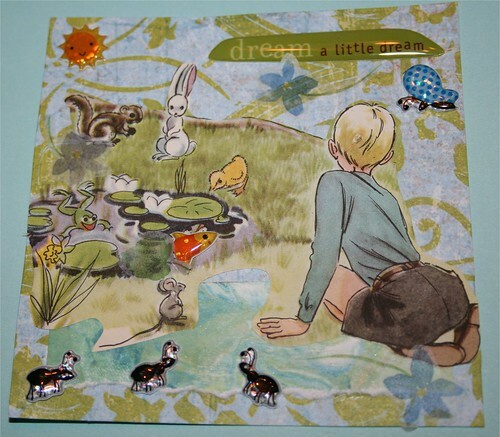 Dream a Little Dream 4" x 4" Collage, originally uploaded by DianthusMoon. I don’t think I’ll miss the heat and humidity as the last of the summer holidays ends today. Not to say it won’t get warm again (maybe 90 for a few days in the middle of the week), but it’s not the same kind of heat as July. And I know I won’t forget the heat that we are endured at the Phillies baseball game on the 26th of July. I made a picnic dinner-potato salad, sliced tomatoes, green beans, strawberries, biscuits and grilled chicken-very yummy. For my collage-I had saved this page for a 1957 Childrens’ music book and added pretty scrapbook paper for the back, some homemade paper from me where the ants are and some very modern puffy stickers. This will be a short week for most people. So much is going on this weekend coming up it has my head spinning! The Mushroom Festival starts on Friday and lasts until Sunday. I love this collage you’ve made, Dianne! Good luck with the cross stitch fabric-size issue!